Superb image quality and super-smart features come together at an incredible price with the 2018 VIZIO E-Series™ 43&quot; Class (42.5&quot; Diag.) 4K HDR Smart TV. With a beautiful and vivid 4K Ultra HD picture, the 2018 E-Series also delivers smart features designed for everyone to enjoy. With the E-Series, you’ll see sharp clarity, deep blacks, and great contrast. 4K Ultra HD resolution treats your eyes to sharp images, while HDR video reveals new depth in every pixel. 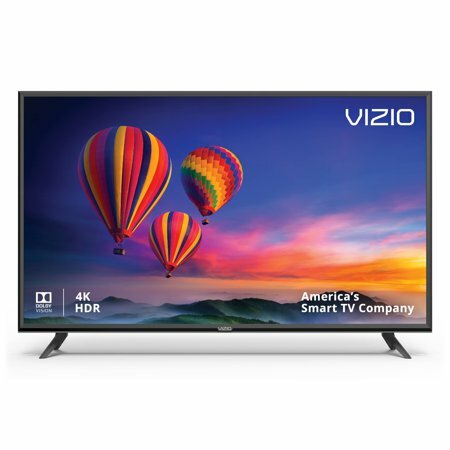 VIZIO’s Active Full-Array backlights create brighter brights and vivid colors in every scene, while VIZIO’s UltraBright 400 provides enhanced brightness in shadows and highlights with up to 400 nits of peak brightness for a more brilliant picture. Finding content is simple with the all-new VIZIO Smart TV. VIZIO WatchFree™ lets you stream over 100 channels absolutely FREE – live news, movies, sports, comedy, music and more. Use the included remote to browse apps directly from the TV screen. And now with voice support for Google Assistant and Amazon Alexa devices, you can control your E-Series without even lifting the remote. The all-new 2018 E-Series offers unbeatable value and enhanced picture performance – along with easy access to all the streaming apps you love. UltraBright 400: Enhance spectral highlights with up to 400 nits of peak brightness. Watching our 70" Vizio E- series is like being in a theater! Our old 70" Vizio smart tv got a line down the center of the tv, probably from gaming an playing split screen but not sure. (6 years old) anyways I called Vizio my warranty was up on my old tv, but they offered me a great deal on a new model. We own all Vizio an for a reason! 100% Best Quality an best customer service! Hello Yvonne, thank you for your feedback it is appreciated. My Vizio E series 70” TV has an excellent picture and also has more features than I expected. This TV is a real value compared to the competitors models! Had Vizio M-Series 75", 4kUHD, it pales in comparison to this model, not that it was bad, it is just that this one is that much better, very happy with it overall. More features than I will need. Much improved over the 50" Viz I bought for my RV four years ago. Only complaint is I can't figure out how to connect the HDMI from my MacBookPro to the Viz HDMI "in" port. I get a teeny pic on the laptop and flashes on the Vizio. I'm sure I just need to reconfigure my Mac and/or the TV to make this work, but so far have tried many solutions with no success, including adjusting Mac's "preferences" in the Display section. I'll get it figured out, I'm guessing, and it was not a problem on the older Vizio set. Would definitely buy this one again. When on ethernet with plenty of megs, the 4K and HDR - when the latter is available - are magical. Great picture with great price. It's an understatement when I say the built in chromecast is amazing. We use PLEX extensively for most of our media. This TV also has the best price for a TV with Dolby Vision capabilities. The remote app for the phone is great too. All in all, this is a great tv for the price. I've had the tv for a few weeks now and it works great. My previous TV was about 7 years old and I was due for an upgrade. This E-Series has all the bells and whistles that I needed, 4K, smart, local dimming, while being super affordable. I could not be happier with my purchase. My only complaint is that the TV only comes with 3 HDMI ports. So many pros and very few cons. It definitely performs as expected. The picture delivers in detail and sharpness. Easy setup and the Vizio app is pretty cool. Factory settings were odd causing a very dim picture at first. Our room can be bright during the day but this set handles it well. Only real shortcoming is scenes with full black can be slightly mottled and it should be viewed mostly head on. I'd buy this again. Great value.